Our Professor Impressive and Doctor What?’s Science Activity Book is featured in Tictail’s Christmas Picks!! You can pick it up for just 2 euro over at our shop! 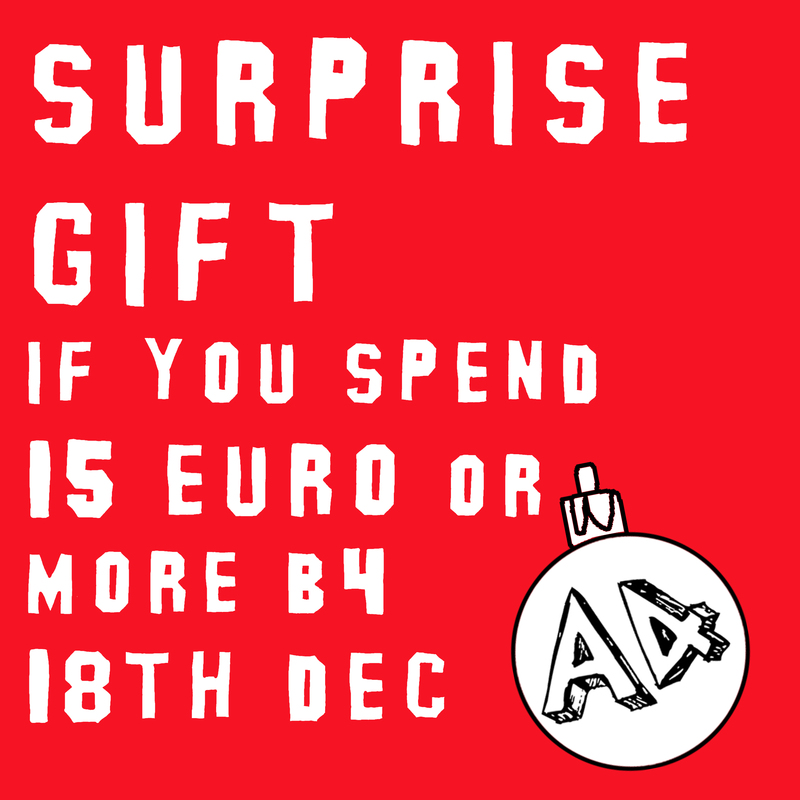 Surprise Gift with your order if you spend 15 euro or more in our shop before 18th Dec!! Now is the time to pick up some Christmas Gifts for your family and friends and we’ll give you a little something for being so good! Where to find us online!! Not everyone enjoys using Facebook, for those that prefer other sites for information gathering and sharing we made a list of all the places you can find us. If you are a member on any of these sites say hello, if you are an artist on tumblr send us some work or a link so we can follow you, Pinterest share some art ideas with us, Vimeo send us links to your videos. You get the idea!! Screen-printing Service Available….Get in Touch!! New A4 Screen-printing service available. We can print t-shirts, jumpers, bags or create prints on paper up to A2. We also offer a design service if you don’t have the skills to create your design yourself. Please get in contact via A4Sounds@gmail.com or here for more info. Check out our shop for some of our own products. All profits go to the running costs of our studio and projects. I (A4) HEART MERCH!!! Printing begins in the studio tonight !! Gonna be a late one!! We’ll be selling our new lovely t-shirts, screen-prints at Independents’ Day on Sunday 23rd, our WOLF PARTY, July 5th, Flea Friday, 12th July both at the Dark Horse Inn and at Dublin’s Maker Faire July 24th. And of course always online at our new shop!! All profits go towards the running costs of A4 Towers, meaning they go directly back to supporting our artists. Come along on Sunday to ensure you get first pick!! We’ll have a stall at this years Independents’ Day, DIY Zine Fair at the Dublin Food Co-op. We’ll be selling a range of digital prints, screen-prints, t-shirts, patches, zines etc. As well as being packed with merch there will be music, film screenings and food for eating. If you are in Dublin come along, it’s only 2 euro in!! We also have merch available on our new online shop!! More to be added over the next few weeks. All profits from the shop and stall go towards the running costs of A4 Towers which means straight back into supporting our artists. Money well spent!